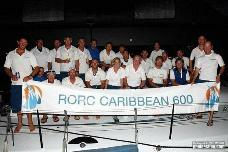 The 2019 RORC Caribbean 600 will start on 18th February off Fort Charlotte, Antigua. The 600nm course circumnavigates 11 Caribbean Islands starting from Fort Charlotte, English Harbour, Antigua and heads north as far as St Martin and south to Les Saintes, off Guadeloupe, taking in Barbuda, Nevis, St Kitts, Saba and St Barth’s. The start takes place on Monday 18th February off Fort Charlotte and spectators will witness boats from around the world as they gather on the start line ready for their 600 nautical mile non-stop race. Spectators can get a great view from Fort Charlotte or from Shirley Heights. There’s also a chance to catch a glimpse of the boats leaving Falmouth Harbour or from English Harbour and Galleon Beach as they make their way to the start line. Armchair racers can join the popular ‘Virtual Regatta’ for the 2019 RORC Caribbean 600 on the race minisite. Over 16,000 entered the last race online. Be prepared to not have much sleep after the start if you sign up!